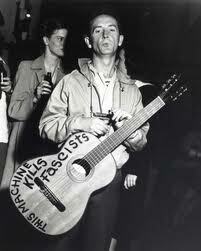 2012 is the 100 years anniversary of the birth of Woody Guthrie. Woody is a legend and is recognised as the “grand-daddy” of folk music tradition. But he was much more than that. He was a poet, a writer, and a social commentator. He spoke out against injustice at a time when it was dangerous to do so. He inspired new generations of musicians, from Bob Dylan to The Clash. I attended a tribute and celebration to Woody this week in the traditional coal-mining community of Treorchy in the South Wales valleys. This was led by Billy Bragg, who has worked closely with Woody’s daughter Nora, to put music to lyrics by her father that had never been recorded. Billy, like Woody, is a songwriter and performer in the Guthrie mould. Politically active, angry about injustice, optimistic about humanity. It was a touching, funny and moving tribute, where Bragg warmly and respectfully held up a lens into Woody’s world and into his incredible mind. “Help win War – beat Fascism” (note: Woody was not afraid to dream big and believe that his music could achieve big things. He famously had the words “This machine kills fascists” written on his guitar). How appropriate might these simple guidelines be to leaders, in all walks of life, today? Woody Guthrie was a special kind of leader. He had no formal authority, he had no position of power. He did not command political position, nor did he operate within corporate, government or religious frameworks. Yet, he spoke to, and through his music and writings, continues to speak to and influence generations of people. People who lead without formal power or authority are often the greatest influencers of all. Think of Ghandi and his passive resistance, or of Mandela during all the years spent on Robben Island, or, more recently, Aung San Suu Kyi, while under house arrest in Burma. Woody Guthrie used song and lyrics to speak out against the way black people were being treated in the deep south of America, at a time when it was dangerous to do so. He spoke up for the role of women, and wrote a song that championed women’s rights (pre-feminism). He highlighted the plight of immigrant workers being brought in from Mexico as slave labour, and then deported as illegals as soon as they were not needed. The Guthrie story also has a special kind of resonance for me personally. This month also marks the 100th birthday of my Aunt Ebie. Ebie (or Elizabeth) is my dad’s big sister, and an absolute gem of a lady, who now lives in Australia. She grew up in Edinburgh, and later in Glasgow. Billy Bragg has discovered an old lyric amongst the Guthrie archives, never before known and never set to music. 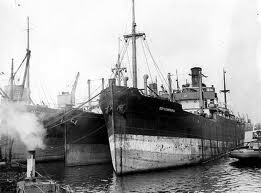 It is called Going Up the Clyde, and was written by Guthrie while in Glasgow after his ship was torpedoed while serving in the Merchant Marine during the war. I can’t wait to hear the song, and I keep thinking of how Woody and Aunt Ebie, both exactly the same age, would have been in Glasgow at that time when the song was being written. Happy Birthday Woody. Writer, Singer, Poet, and, above all, Leader. And, Happy 100th Birthday Aunt Ebie. This entry was posted in authority, leadership and tagged authority, Billy Bragg, Glasgow, leader, leadership, River Clyde, Treorchy, Woody Guthrie by louiscollinsblog. Bookmark the permalink.